When I got accepted to be part of Team nuun, I knew I was going to become part of a special family, meet some pretty amazing athletes and people from nuun HQ. Needless to say I felt blessed and still feel blessed. 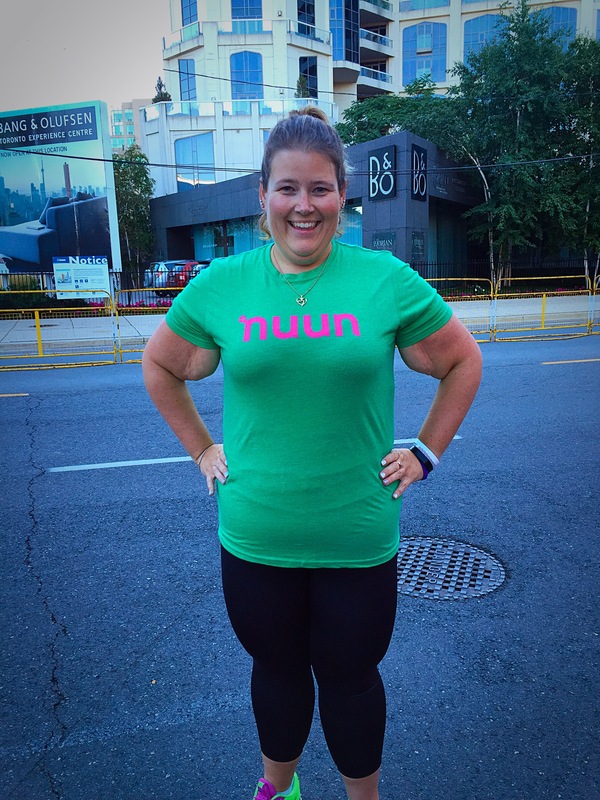 I know I previously blogged about being accepted by nuun for who I am. Not what they wanted me to become. They accepted me as me. My heavy weight and what my ability is to run. I’ll never place in the top. But they still loved me anyways and took a chance on me. I tell people I’m a part of team nuun. I’m part of the family and they look at me and I always say it’s awesome eh. They love everyone and every ability the same. They don’t discriminate or set limits on who they bring on as part of the team. So fast forward to early spring and I got the incredibly chance to spread my cheer, happy vibes and love for nuun as a field hydration specialist (FHS). I was nervous my first time going to be trained. But I soon realized I have the knack as I always knew I did with my nuun passion I learned to thrive in this gig. So here is the reason I truly love doing this gig… I meet lots of interesting people, those suffering from nerves to those who’ve trained and know they are going to kill it on the course. At a recent expo I got the fun times of talking to over 400+ people. One woman stopped to learn about nuun and I got to chatting with her about her running, future races etc. She confided in me this was her first ever 5k. I discussed her game plan for race day, offered suggestions for timing and speed. She asked me a whole bunch on how to deal with nerves etc. I answered them honest. You never ever should sugar coat an answer. Race day happened and I was working the finish line. This woman finished, came to me, gave me the biggest sweatiest hug one could give someone. She was crying and all smiles. She couldn’t thank me enough. She said my advice was bang on. She said the running bug might of just bite her. She asked me about nuun and I explained I’m part of the family not just as a FHS but as a runner, I said I’m legit. I’m on a website. But I said nuun is one of the few companies that acknowledged all skill levels and endurance levels. We all get to the same finish line, we all still sweat running and need electrolytes to replenish our bodies. We all deserve the health stuff, that’s free of sugars, colours and ingredients I can’t even pronounce without the help of Google. So with each run event I’ve done. I’ve met runners of all skill levels, given high fives, hugs, tissues and become a photographer. I’ve loaned my phone for someone to call home about a new PB. I’ve been me. I’ve spread nuun love. I’ve encouraged people to sign up for learn to run programs, told them if I can run: you can run. Our weight and size is not an excuse. I said nuun believes in me and I believe in you. I’ve connected with people and offered to go for runs with them from doing events like this. I spread love and happiness. I believe and fully stand behind nuun. It’s gotten me across a few finish lines when I’ve been questioning my own sanity. When I first became a FSH no nuun shirt fit me. As I’ve continued on my own hard work journey, I can happily say I now own a FHS shirt and it fully fits!! It truly was a happy moment for me. I feel more legit. So to finish, I love being a FHS not just for the benefit of spreading nuun love but sharing in others joys and personal victories. We all cross the same finish line. < Previous Dedicated to me…. Jodie, you are such an inspiration! This post may have made me tear up a little. Thank you for being YOU! You’ve made me even prouder to work for Nuun. This is a great post Jodie! Congrats on so many levels. Keep spreading the love & running. There are no limits.